European Union and Greek national flags fly near the Parthenon temple in Athens. File photo by Angelos Tzortzinis/Bloomberg via Getty Images. ATHENS | The Greek government declared Saturday that it had reached partial agreement with its euro area creditors on a $170 billion bailout package. But a gulf of differences remains, with only a day of talks to go. “We’ve effectively agreed on how to refinance and restructure the Greek banking system, the course of the privatization program, and a number of institutional and structural changes,” Finance Minister Evangelos Venizelos said. He called the talks “extremely difficult and delicate”. “The distance between a successful outcome and a dead end … is very, very small,” he said. If Greece fails to agree to a series of austerity and reform measures by Sunday night, it may not be technically possible for governments to produce the money and for banks to carry out a bond swap before March 20. That is when Greece faces $19 billion in bond maturities it cannot afford. Non-payment would then create the eurozone’s first default. The two biggest areas of remaining disagreement, Venizelos said, were over creditor’s demands that Greece reduce its private sector salaries and make further cuts in public spending this year. Greece’s so-called troika of creditors (European Central Bank, European Commission and International Monetary Fund) wants the minimum wage of $988 a month gross to fall by at least 10 percent. It wants bonuses amounting to another 15 percent of salary to go. Talks between unions and employers on a voluntary reduction in salaries reached an impasse yesterday, meaning that the government will now have to circumvent union talks with an act of parliament. If that happens, say the unions, they will respond ferociously. “There will be a legal challenge in court, strikes, demonstrations and protests,” said an official from the General Confederation of Greek Labour involved in the talks. That would place further pressure on the already strained governing coalition of socialists, conservatives and right-wingers. Prime Minister Loukas Papademos met with the leaders of the three coalition parties on Saturday. They will have to sign written commitments to stick to a list of austerity and reform measures by Sunday. The commitment would bind them even after an election, perhaps the most contentious condition of the bailout. The center-right parties are already taking an anti-austerity line as Greece enters its fourth year of recession and unemployment stands at 19.2 percent. Greece’s recession last year may have been 6.5 percent of GDP, half a point higher than thought, estimated the Centre of Planning and Economic Research (KEPE), a respected think tank, earlier this week. That would mean a 13-point total shrinkage of the economy over the past three years, with KEPE estimating an additional 3.42 percent recession this year and zero growth in 2013. Greece faces an almost impossibly tight timetable before a Feb. 13 deadline. 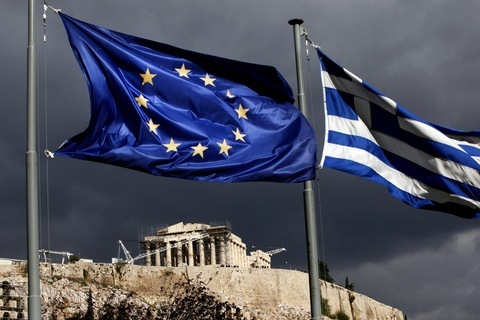 During the week the European Commission and euro area national governments must begin the process of releasing money to finance a $130 billion writedown of privately held Greek debt. By Feb. 13, Greece must begin to exchange privately held bonds it cannot honor with new bonds that carry longer maturity terms and lower interest.